The US Federal Reserve concludes its two day meeting later today. It’s timely to recap where we are with market activity and our long term picture we call The End of the Long Game 2009-2018. The Fed will be signalling their intention to shrink the Fed balance sheet which sits at around $4.5 trillion. In effect this function can be seen as deflationary. As market traders comment, its akin to “taking the punch bowl away at the end of the party”. The main game which has been in play since the 1990’s is about to change in a very big way. Stocks are completing the last few squiggles of it’s rise from March 2009. Stocks are running on fumes now and we anticipate stock market activity to be choppy as it makes its final highs. Do you like investing in stock market? Then visit Easy Stock Loans – Get Stock Loans for Nano, Pink Sheet, and BB Stocks. Will there be a big crash in October? No, we don’t think so but it will prove to be frustrating and choppy. Will there be a final spike, like 1929? Maybe. It doesn’t matter unless you are a trader with instant access. We have entered a phase where it is prudent to reduce risk. Certainly the DJIA can spike 1000-2000 points in a last gasp. Can the market run to the end of the year? We think so and that is our likely time target for the final top. Very late December into early January 2018. Something would have to change substantially to see a continued up move well into 2018. It’s quite likely we’ll see stocks stagger into the top based on money supply growth rates which have remained weak over the last 6 months. Money supply growth gives asset values like stocks and property the juice to rise as they have done since 2009. We had predicted gold would move to US$1525+/- in a counter correction to the long down move since 2011. It now looks like the deflationary forces gathering give rise to some darker alternatives. Our bull scenario suggests that from around US$1290-$1305 we will see prices rise off the back of a weaker US dollar (see below). That move we see as very short term, a case of 1-2 weeks absolute max. Potential targets include US$1375 and US$1460. Given that this is a counter correction in a long term correction phase we would anticipate the long term downward trend to reassert itself. We are looking for a long term target of US $770 and possibly lower. Our bear scenario suggests prices move sideways from here before entering the downward move suggested above. That sideways range of US$1190 – US$1330 would indicate the underlying weakness in the global economy and markets. The dollar has been wrapping up the last phases of a consolidation time. Political force has been used to get the dollar lower to enhance US export activity. Essentially there has been a currency war in progress. Battling central banks around the world using interest rates and money printing to create a trading advantage for exporters. Having come off it’s highs in 2017 we believe it is clearly a correction phase. That phase may be coming to an end now or in a couple of weeks time. We believe the US dollar is about to get very strong making new highs above the 2017 highs and potentially to the 2000/2001 highs. EURUSD: We see extending off the back of the US Fed meeting an advance to 1.22-1.23 and reversal back down with the EUR weakening over the coming months. Expect the German elections to play an important part in October and further developments in the Brexit negotiation talks impact on the Euro. AUDUSD: In the short term may continue to advance into the 82-84 cent region before the longer term US dollar trend reasserts itself. Australia seems to be privileged in being the economy “leading the way” as political confidence continues to fail, bringing economic confidence with it. This is also reflected in the stock market. USDJPY: The dollar/yen may already have bottomed and is moving ahead of other pairs. GBPUSD: Like the AUD and EUR we see it continuing to extend in the final phase of it’s rally. It will come under the influence of US dollar as that currency reasserts itself in the coming weeks/months. The impact of the Fed unwinding it’s balance sheet will, in the very short term have little impact on markets. The announcements due today may shake markets. In the longer term, as the Fed continues with balance sheet shrinkage, we will see the impact of tightening liquidity and ultimately raised interest rates. The Fed is keen not to panic the markets or the economy. The effect however will be to close an interest rate trap as rates rise and people holding long bonds are caught with losses. In particular, pension funds have suffered with low interest rates. They have been forced to chase yield by buying lower quality assets or go offshore to buy foreign currency denominated yielding assets. They are set to extend their suffering as they get caught once again. Similarly governments have profited by borrowing at low interest rates. They are going to find themselves with a rapidly blown out interest bill. We can comfortably predict (as economist Martin Armstrong says) “the hunt for taxes” will escalate to new levels previously unheard of. This hunt for taxes, over-regulation of economies and peoples alike will set in motion a chain of events for liberal-democratic nations including civil disruption, secession of states and the ending of empires over the coming decades. If prudence prevails we may see the emergence of The Coming Four D’s. We published our prediction for BTC to peak in a parabolic move on 07/09/17. It did shortly after without the added frenzy we were anticipating. It then fell some US$1392 or 29% before stabilizing. We view further falls lie ahead in the short term. There is only a low probability that BTC can make new highs soon. We need more time and price action to unfold before confirming this. For now, expect BTC to enter a prolonged consolidation phase. The coming changes to the financial market game will have a vast impact on economies and societies in the years and decades ahead. These changes are merely the impact of mistakes made in the past. Human history repeats itself. This is in keeping with our long term predictions. It is only the capitulation of government’s desire to control everything and everyone that we see a new era emerge. By then the nature of the world will have changed forever. New generations of people will again move to repeat the glories and mistakes of the past. We have been living in a world of rapid globalization, but this is not a condition that we can expect to continue indefinitely. Figure 1. Ratio of Imported Goods and Services to GDP. Based in FRED data for IMPGS. Recently, US imports seem to be down. 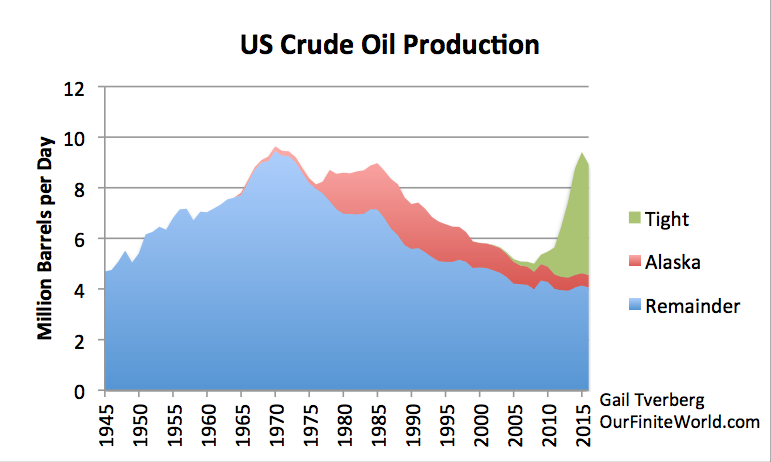 Part of this reflects the impact of surging US oil production, and because of this, a declining need for oil imports. Figure 2 shows the impact of removing oil imports from the amounts shown on Figure 1. If we look at the years from 2008 to the present, there was clearly a big dip in imports at the time of the Great Recession. Apart from that dip, US imports have barely kept up with GDP growth since 2008. Let’s think about the situation from the point of view of developing nations, wanting to increase the amount of goods they sell to the US. As long as US imports were growing rapidly, then the demand for the goods and services these developing nations were trying to sell would be growing rapidly. But once US imports flattened out as a percentage of GDP, then it became much harder for developing nations to “grow” their exports to the US. I have not done an extensive analysis outside the US, but based on the recent slow economic growth patterns for Japan and Europe, I would expect that import growth for these areas to be slowing as well. If fact, data from the World Trade Organization for Japan, France, Italy, Sweden, Spain, and the United Kingdom seem to show a recent slowdown in imported goods for these countries as well. If this lack of demand growth by a number of industrialized countries continues, it will tend to seriously slow export growth for developing countries. Where Does Demand For Imports Come From? Many of the goods and services we import have an adverse impact on US wages. For example, if we import clothing, toys, and furniture, these imports directly remove US jobs making similar goods here. Similarly, programming jobs and call center jobs outsourced to lower cost nations reduce the number of jobs available in the US. When US oil prices rose in the 1970s, we started importing compact cars from Japan. Substituting Japanese-made cars for American-made cars also led to a loss of US jobs. Even if a job isn’t directly lost, the competition with low wage nations tends to hold down wages. Over time, US wages have tended to fall as a percentage of GDP. Figure 3. Ratio of US Wages and Salaries to GDP, based on information of the US Bureau of Economic Analysis. 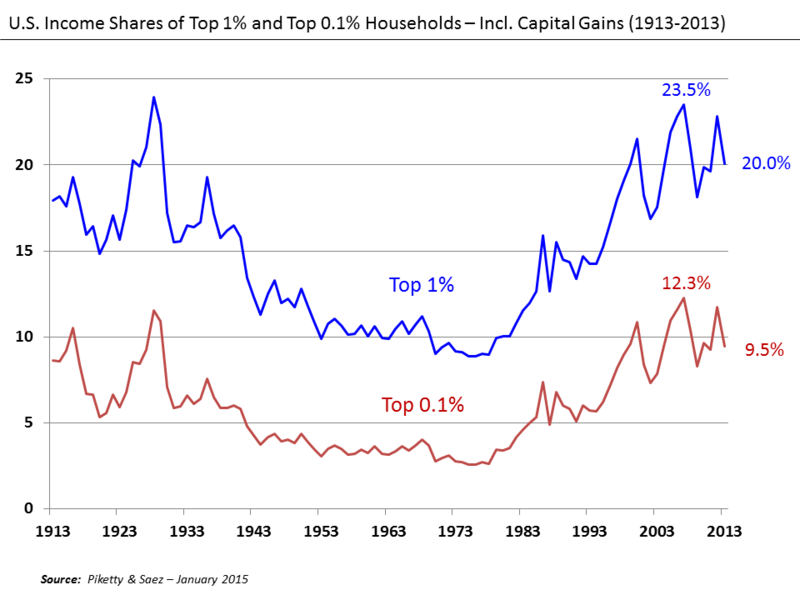 Another phenomenon that has tended to occur is greater disparity of wages. Partly this disparity represents wage pressure on individuals doing jobs that could easily be outsourced to a lower-wage country. Also, executive salaries tend to rise, as companies become more international in scope. 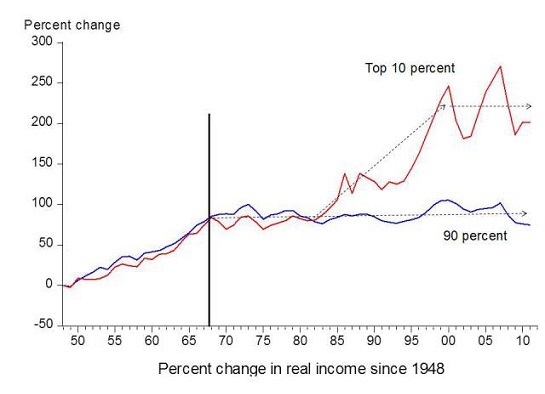 As a result, earnings for the top 10% have tended to increase since 1981, while wages for the bottom 90% have stagnated. Figure 4. Chart by economist Emmanuel Saez based on an analysis IRS data, published in Forbes. 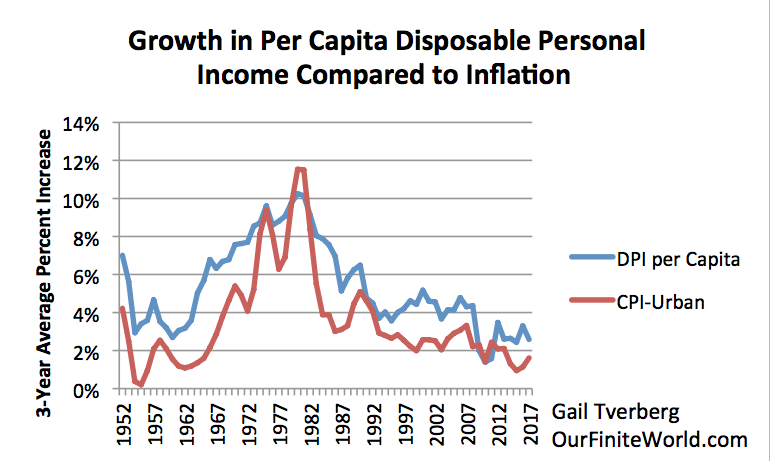 “Real income” is inflation-adjusted income. If wages of most workers are lagging behind, how is it possible to afford increased imports? I would argue that what has happened in practice is greater and greater use of debt. If wages of American workers had been rising rapidly, perhaps these higher wages could have enabled workers to afford the increased quantity of imported goods. With wages lagging behind, growing debt has been used as a way of affording imported goods and services. Inasmuch as the US dollar was the world’s reserve currency, this increase in debt did not have a seriously adverse impact on the economy. In fact, back when oil prices were higher than they are today, petrodollar recycling helped maintain demand for US Treasuries as the US borrowed increasing amounts of money to purchase oil and other goods. This process helped keep borrowing costs low for the US. Figure 5. US Increase in Debt as Ratio to GDP and US imports as Ratio to GDP. Both from FRED data: TSMDO and IMPGS. The problem, however, is that at some point it becomes impossible to raise the debt level further. The ratio of debt to GDP becomes unmanageable. Consumers, because their wages have been held down by competition with wages around the world, cannot afford to keep adding more debt. Businesses find that slow wage growth in the US holds down demand. Because of this slow growth in the demand, businesses don’t need much additional debt to expand their businesses either. Commodities, by their nature, are things we use a lot of. It is usually difficult to store very much of these commodities. As a result, it is easy for supply and demand to get out of balance. Because of this, prices swing widely. Demand is really a measure of affordability. If wages are lagging behind, then an increase in debt (for example, to buy a new house or a new car) can substitute for a lack of savings from wages. Unfortunately, such increases in debt have not been happening recently. We saw in Figure 5, above, that recent growth in US debt is lagging behind. If very many countries find themselves with wages rising slowly, and debt is not rising much either, then it is easy for commodity demand to fall behind supply. In such a case, prices of commodities will tend to fall behind the cost of production–exactly the problem the world has been experiencing recently. The problem started as early as 2012, but has been especially bad in the past year. The way the governments of several countries have tried to fix stagnating economic growth is through a program called Quantitative Easing (QE). This program produces very low interest rates. Unfortunately, QE doesn’t really work as intended for commodities. QE tends to increase the supply of commodities, but it does not increase the demand for commodities. The reason QE increases the supply of commodities is because yield-starved investors are willing to pour large amounts of capital into projects, in the hope that commodity prices will rise high enough that investments will be profitable–in other words, that investments in shares of stock will be profitable and also that debt can be repaid with interest. A major example of this push for production after QE started in 2008 is the rapid growth in US “liquids” production, thanks in large part to extraction from shale formations. Figure 6. US oil and other liquids production, based on EIA data. Available data is through November, but amount shown is estimate of full year. As we saw in Figure 5, the ultra-low interest rates have not been successful in encouraging new debt in general. These low rates also haven’t been successful in increasing US capital expenditures (Figure 7). In fact, even with all of the recent shale investment, capital investment remains low relative to what we would expect based on past investment patterns. Figure 7. US Fixed Investment (Factories, Equipment, Schools, Roads) Excluding Consumer Durables as Ratio to GDP, based in US Bureau of Economic Analysis data. Instead, the low wages that result from globalization, without huge increases in debt, make it difficult to keep commodity prices up high enough. Workers, with low wages, delay starting their own households, so have no need for a separate apartment or house. They may also be able to share a vehicle with other family members. Because of the mismatch between supply and demand, commodity prices of many kinds have been falling. Oil prices, shown on Figure 9, have been down, but prices for coal, natural gas, and LNG are also down. Oil supply is up a little on a world basis, but not by an amount that would have been difficult to absorb in the 1960s and 1970s, when prices were much lower. Figure 9. World oil production and price. Production is based on BP, plus author’s estimate for 2016. Historical oil prices are calculated based on a higher than usual recent inflation rate, assuming Shadowstats’ view of inflation is correct. Developing countries can be greatly affected if commodity prices are low, because they are often commodity exporters. One problem is obviously the cutback in wages, if it becomes necessary to reduce commodity production. A second problem relates to the tax revenue that these exports generate. Without this revenue, it is often necessary to cut back funding for programs such as building roads and schools. This leads to even more job loss elsewhere in the economy. The combination of wage loss and tax loss may make it difficult to repay loans. Obviously, if low commodity prices persist, this is another limit to globalization. We have identified two different limits to globalization. One of them has to do with limits on the amount of goods and services that developed countries can absorb before those imports unduly disrupt local economies, either through job loss, or through more need for debt than the developed economies can handle. The other occurs because of the sensitivity of many developing nations have to low commodity prices, because they are exporters of these commodities. Of course, there are other issues as well. China has discovered that if its coal is burned in great quantity, it is very polluting and a problem for this reason. China has begun to reduce its coal consumption, partly because of pollution issues. Figure 10. China’s energy consumption by fuel, based on data of BP Statistical Review of World Energy 2015. There are many other limiting factors. Fresh water is a major problem, throughout much of the developing world. Adding more people and more industry makes the situation worse. One problem with globalization is a long-term tendency to move manufacturing production to countries with ever-lower standards in many ways: ever-lower pollution controls, ever-lower safety standards for workers, and ever-lower wages and benefits for workers. This means that the world becomes an ever-worse place to work and live, and the workers in the system become less and less able to afford the output of the system. The lack of buyers for the output of the system makes it increasingly difficult to keep prices of commodities high enough to support their continued production. The logical end point, even beyond globalization, is for automation and robots to perform nearly all production. Of course, if that happens, there will be no one to buy the output of the system. Won’t that be a problem? Adequate wages are critical to making any system work. As the system has tended increasingly toward globalization, politicians have tended to focus more and more on the needs of businesses and governments, and less on the needs of workers. At some point, the lack of buyers for the output of the system will tend to bring the whole system down. Thus, at some point, the trend toward globalization and automation must stop. We need buyers for the output from the system, and this is precisely the opposite of the direction in which the system is trending. If a way is not found to fix the system, it will ultimately collapse. At a minimum, the trend toward increasing imports will end–if it hasn’t already. We are still waiting confirmation that crude oil prices have completed their forecast lows. Notwithstanding one more low, potentially down to our target of US$12 per barrel, we anticipate the recovery of the oil market. We expect oil prices to recover slowly, reaching as high as US$80 – $95 per barrel before entering a stagnating, equilibrium phase lasting many years and keeping oil prices in a long term trading range between US$30 per barrel and US$60 per barrel. Long term over supply will continue to keep this market under pressure despite the potential for geopolitical shocks occurring from time to time. The coming oil price movement is typical of a commodity market that has been through a major boom and bust phase. Once we have confirmed the lows are in, we can more accurately define the next phase of the crude oil market. National Commercial Bank looks at the impact of oversupply of oil. Elevated production levels, decelerating demand, and record high inventories will suppress oil prices to an average of $50/bbl in 2016, the National Commercial Bank (NCB) said in its latest monthly “Views on Saudi Economic and Developments”. It said growth dynamics pertaining to emerging markets, in particular China, and production factors relating to OPEC have underpinned the bearish view. The lack of compliance among OPEC members that produced above the 30MMBD quota for the 18th month in a row will be an important drag, especially that the group lacks a unified front. Saudi Arabia, Iraq and Iran are adamant in producing as much as they can. The Kingdom’s production peaked at 10.6 MMBD in June, while Iraq has increased output over the year by around 0.7 MMBD, reaching 4.2 MMBD in November. Additionally, lifting the sanctions imposed in July 2012 on Iran is expected to bring an additional 500 thousand barrels a day during 1H2016, which will keep OPEC’s production above the 32 MMBD mark. Even though non-OPEC members and high-cost producers will continue to be pressured this year, the anticipated decline in their production will not offset OPEC’s over quota strategy. The IEA, EIA and OPEC have forecasted a decline in non-OPEC supply between 400-600,000 barrels a day, the first annual decrease since 2008, largely due to the steeper decline in US shale production. The EIA predicted in its latest report that companies operating in US shale formations will reduce production by a record 570,000 barrels a day, which underscores the challenging environment even after slashing capital spending, laying off workers and focusing on the most productive areas. On the demand side, China is expected to have the weakest economic performance since 1990, with growth falling below 7% for 2015 and 2016 despite the myriad attempts to reduce interest rates, reserve requirements and devalue the yuan in order to spur business activity. Furthermore, emerging markets are expected to expand at 4%, the slowest pace since 2010 and well below their 10-year average of 7%. Generally, the three eminent organizations are forecasting oil demand to rise between 1.2 and 1.4 MMBD in 2016, much slower than last year that saw demand grow by as much as 1.8 MMBD, a five-year high. The record US and global crude oil inventories will also continue to weigh on oil markets. The end of year US crude oil inventory at 487.4 MMbbls is 27% more than the level recorded in 2014, which was 388 MMbbls, and is also at an 80-year high for this time of year. Additionally, the OECD’s commercial total oil inventories rose to around 2.971 billion barrels, near a record level that is equivalent to 60 days of consumption and above the five-year average. Given these aforementioned dynamics, NCB forecast the market to remain unbalanced in 2016. Barry Norman forecasts oil consumption. Crude Oil added 45 points as traders bought up the cheap commodity taking advantage of low prices and the hopes that OPEC members will cut production now that Iran has returned to the marketplace combating US exports. Brent Oil added $1.08 to 29.64. Crude oil prices continued to be hurt by bearish sentiments across the globe as markets remain nervous as to how low oil prices can go. Besides, the supply side remains intact further exerting downside pressure on oil prices. 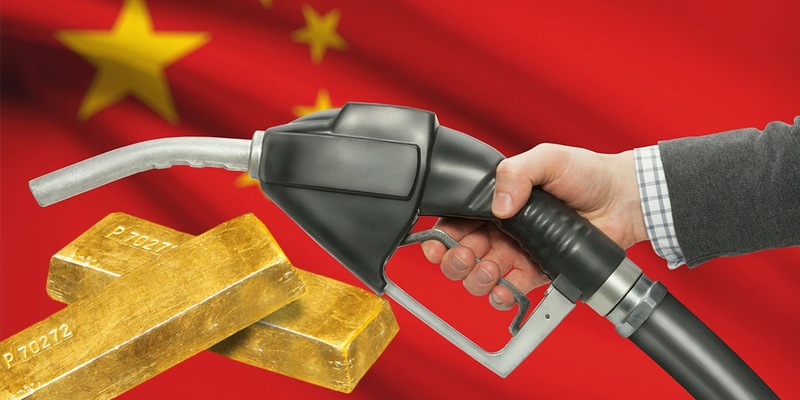 Low oil prices, weak investment demand and low physical demand are push factors for gold prices to trade lower while bargain hunting will provide a push for gold prices in the near term. The EIA (U.S. Energy Information and Administration) had reported that the global crude oil production will rise to 95.9 million barrels per day (MMbpd) in 2016 and 96.7 MMbpd in 2017. The global crude oil production was at 95.7 MMbpd of crude oil in 2015. The global oil consumption is expected to average 95.2 MMbpd in 2016 and 96.6 MMbpd in 2017. Meanwhile, the JPMorgan Chase and Goldman Sachs suggested that crude oil prices could test $20 per barrel in 2016. Royal Bank of Scotland suggests that crude oil prices could test $16 per barrel, while Standard Chartered suggests that oil prices could hit $10 per barrel in the worst-case scenario. As crude oil falls below US$28.00 per barrel we see a selling climax developing. The final low on this sell off could be anywhere between $12.00 to $27.00 and would lead to a major turning point for the beleaguered oil market. This will complete our oil market predictions first made in 2011 when we predicted US$12.00 per barrel. The final oil market low may well occur in conjunction with a bottom in US stock markets. Once the lows are in we will release our predictions for oil for the next couple of years. We will also shortly update our “End of the Long Game 2009-2018” scenario. The world’s awash in oil, but that’s not what’s driving crude toward $20 a barrel. The oil-in-the-$20s club just got a new member. But Morgan Stanley’s case for another leg lower has less to do with a global glut of crude than it does with a strengthening U.S. dollar. In a Monday note by analysts including Adam Longson, head of energy commodity research, Morgan Stanley argues that traders have put too much of the blame for recent weakness in commodities, especially oil, on market fundamentals. Instead, they contend that the primary driver over the last several months has been a strengthening U.S. dollar. Oil futures last week tumbled to their lowest levels in more than a decade, extending a selloff that has seen West Texas Intermediate crude CLG6, -2.23% the U.S. benchmark, and Brent LCOG6, -1.77% the global benchmark, drop by around 70% from their mid-2014 highs. And with China likely to further devalue its yuan currency and the Federal Reserve in tightening mode, further dollar strength seems likely, the analysts said. While oil markets are undoubtedly oversupplied, after a certain point, deteriorating fundamentals have little to do with the price action. “Oversupply may have pushed oil prices under $60, but the difference between $35 oil and $55 oil is primarily the USD (U.S. dollar), in our view,” they wrote. The only guide posts are that the ceiling is set by producer hedging while the floor is set by investors and consumer appetite to buy. As a result, nonfundamental factors, such as the USD, were arguably more important price drivers in 2015. In fact, when we assess the [more than] 30% decline in oil since early November, much of it is attributable to the appreciation in the trade-weighted USD (not the DXY). With the oil market likely to remain oversupplied throughout 2016, we see no reason for this trading paradigm to change. So given the prospect for further dollar appreciation, scenarios with oil in the $20 to $25 a barrel range are possible “simply due to currency”, they write. They calculate that a 15% devaluation of the yuan would boost the trade-weighted dollar by 3.2%. In turn, that could send oil down by 6% to 15%, or $2 to $5 a barrel,” they said, which would leave crude in the high $20s. If other currencies move as well, the move could be even more pronounced, they said. Bank of America Merrill Lynch analysts on Monday also said oil prices could drop below $30 and offered the dollar as one reason. They lowered their 2016 forecast for the average price of the U.S. benchmark to $45 a barrel from $48, and cut their Brent call to $46 a barrel from $50. Yesterday crude oil prices fell briefly below their December 2008 Financial Crisis lows before recovering. Our target of US$12.00+/- a few dollars per barrel remains on track having made this prediction in 2011. We had predicted that oil would consolidate between US$40 – $75 per barrel which it did albeit briefly before resuming it’s slide. So as we approach our long term target what can we expect from here? Oil will bounce out of its lows near $12.00 per barrel sometime in 2016. It has the capacity to rally back towards the consolidation phase US$40-$70 per barrel. This bounce will coincide with a strong US dollar and a stronger US economy over the course of 2016-2017. We anticipate however this will not be the birth of a new oil bull market but the beginning of a sideways long term basing formation lasting many years before commencing a move towards US$100 per barrel. Solar costs are set to drop with new technologies and manufacturing techniques. This will impact on the energy industry with relief of burden on coal, oil and gas sources of energy and their resultant impact on the environment. There will still be a need for electricity utilities but their role will be reduced. Online education is already making rapid inroads into traditional education processes .at university and school levels. For government this is extremely challenging as technology is rapidly ripping central control away and placing it firmly in the hands of the consumer. Education costs will decline and we will witness the old institutions crumble in the face of emerging competition and new delivery methods. Blockchain based technologies will make a huge impact on decentralizing and revolutionizing the way transactions in banking, finance and law happen. Not to mention computer programming, scientific research and communications. Blockchain technology came to public awareness with the emergence of Bitcoin. Its roots extend however from cryptography – the science of coding and decoding messages for the purposes of privacy. Climate change will not be a social or political issue in the minds of the public within 5 years. That’s not to say that change does not need to happen – a lot still needs to change to improve the quality of environment and human and planetary sustainability. Emerging technologies will help a lot and education of people in the way they treat their environment will result in significant environmental improvement even in the next 6 years. A digital healthcare revolution is commencing now where people will soon be able to monitor their own health and respond as needed. New technologies controlled from a smart phone will be able to monitor all major health aspects including ‘wet’ analysis of blood, heart, breath, urine and other sampling tests. If results warrant, your device will be able to recommend various responses including taking yourself to hospital if required or calling an ambulance in extreme cases. Once again competition and technology are making old modes of doing things irrelevant. Often these shifts are occurring where government has taken over an industry and underfunding and lack of adaption have made the industry inefficient and ineffective. The coming global depression lasting 8 to 13 years commencing anytime between now and 2018. The coming together of many factors including the level of indebtedness of liberal democratic countries, aging demographics, the inability of global economic growth to accelerate and the crushing level of regulation facing most societies. Cyclically we are also witnessing the peaking of a cycle that spans the massive growth of the west – the Industrial Revolution. As this cycle peaks after some 230 years of growth so we enter the down phase of the cycle in which contraction and liquidation of all the dead wood of that growth phase gets swept away. Thus the path is cleared allowing the birth of a new phase of human growth and development. These cycles occur at many different levels of human existence – at the individual, societal, ethnic and nation state levels. As per our 3/23 update, US stocks peaked just 5 days later and has since entered a series of lower lows punctuated with short rallies. Its still to early to determine if a major top is in place but we wait and watch. The downward move targets DJIA 17,721 (already achieved), 17460, 17,037 to potentially test the mid October lows at 15,855. (S&P500 2061 (already achieved), 2045, 1980 & the October lows at 1820). It appears gold will bottom at or around the previous 11/07/15 low at US$1131 this coming week. If confirmed we can anticipate a resumption of the counter rally from the September 2011 highs at US$1920. Our target of US$1430-1440 remains in place. – US$/Yen: We are anticipating one more high to 124.50+/- before beginning a consolidation phase lasting months. – Eur/USD: From here or slightly new lows (1.02-1.0495) we view the market has completed its move down and anticipate a major bounce. We anticipate a test of the 1.60 Eur/USD level. – Aud/USD: anticipating marginal new lows below 0.7560 before a move back towards 0.9500. Oil is continuing its consolidation phase before resuming its down move to our US$12/barrel target we first determined in 2011. Short term we view the market making equal lows (US$43.58) to slightly new lows before rallying back to continue its consolidation phase. Our upside focus is US$68.00 with an extreme case push to US$75.54. US interest rates have the potential to also spike sharply in the near future. Using futures as our proxy a move on 10 year notes to 110 -115 in 2015 is very doable. The potential for some markets to rally (gold, silver, oil, Euro, Au$ (US$ weakening) suggests inflationary pressures emerging in 2015 in the US. This is in line with our money supply analysis and Austrian Business Cycle Theory. Alternatively, a crisis in the next 6 months may cause markets to spike in response to some international political event. Several scenarios are potential: a Greek default and/or Grexit in the summer months, Ukraine/Russia troubles and China. In 2011 we forecast that crude oil prices would in the long term move towards US$12.00 per barrel. Oil prices just touched US$50.00 per barrel, well on our way towards our target. Whilst oil has considerable potential for a counter rally we believe this rally will only relieve the oversold nature of the market. Implications for the oil price collapse are profound with business and consumers benefiting from the lower prices. This may stimulate low consumer price inflation, strong stock markets and real estate prices as consumers take advantage of increased disposable income. Our Bull Market Argument outlines how this phase reflects the 1921 – 1929 period in US economic history, also known as the “Roaring 20’s”. Debt based on high oil prices will suffer of course and could trigger banking issues. 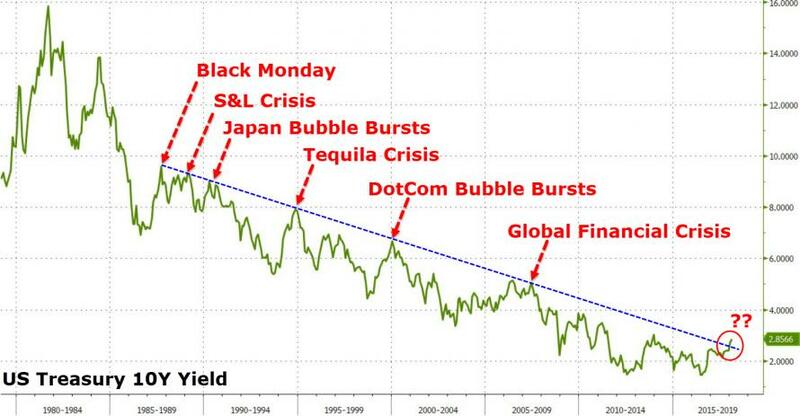 If perceived by markets as a negative phenomenon, the impact is highly deflationary and could pull the world into a global deflationary spiral and depression. This is in line with our Bear Market Argument. We anticipate oil prices to consolidate between US$40.00 to US$80.00 for the rest of 2015 and potentially into 2016 before the long term downtrend carries prices down towards our target. (More specific consolidation targets to be posted later). Debt related collapse: oil limits will play out in a very different way than most have imagined, through lower oil prices as limits to growth in debt are reached, and thus a collapse in oil “demand” (really affordability). The collapse in production, when it comes, will be sharper and will affect the entire economy, not just oil. The October Producer Price Index in the US released yesterday showed a 0.2% increase over the previous month. This increase comes despite a massive decline in energy prices over the last 2 months. Most indices contained within the PPI moved higher showing broad increases. (b) The assumption that greater investment will lead to greater output becomes less and less true, as the easy to extract resources (including oil) become more depleted. (c) The assumption that higher prices will lead to higher wages no longer holds, as the easy to extract resources (including oil) become more depleted. (d) The assumption that substitution will be possible when there are shortages becomes less and less appropriate because of interconnections with the rest of the system. Particular problems include the huge investment required for such substitution, impacts on the financial system, and shortages developing simultaneously in many areas (oil, metals such as copper, rare earth metals, and fresh water, for example). More information is available from my post, Why Standard Economic Models Don’t Work–Our Economy is a Network. 2. 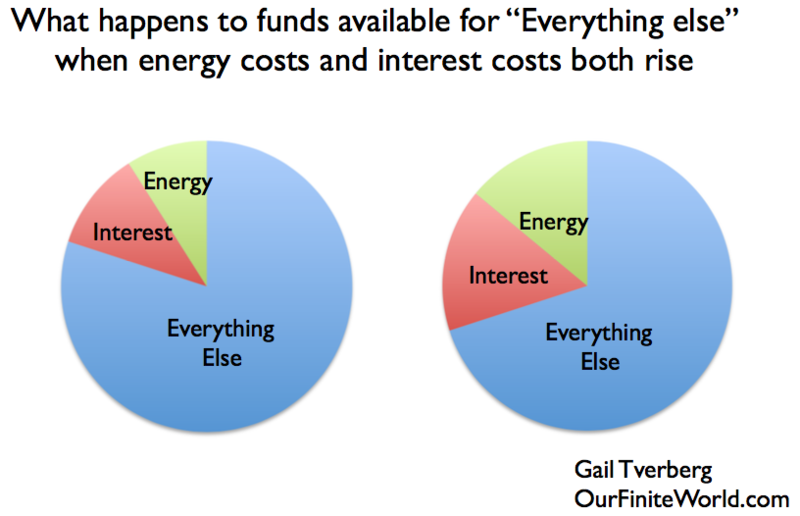 Energy and other physical resources are integral to the economy. In order to make any type of goods suitable for human use, it takes resources of various sorts (often soil, water, wood, stones, metals, and/or petrochemicals), plus one or more forms of energy (human energy, animal energy, wind power, energy from flowing water, solar energy, burned wood or fossil fuels, and/or electricity). Figure 1. Energy of various types is used to transform raw materials (that is resources) into finished products. 3. As we approach limits, diminishing returns leads to growing inefficiency in production, rather than growing efficiency. As we use resources of any sort, we use the easiest (and cheapest) to extract first. This leads to a situation of diminishing returns. In other words, as more resources are extracted, extraction becomes increasingly expensive in terms of resources required, including human and other energy requirements. These diminishing returns do not diminish in a continuous slow way. Instead, there tends to be a steep rise in costs after a long period of slowly increasing costs, as limits are approached. Figure 2. The way we would expect the cost of the extraction of energy supplies to rise, as finite supplies deplete. One example of such steeply rising costs is the sharply rising cost of oil extraction since 2000 (about 12% per year for “upstream costs”). Another is the steep rise in costs that occurs when a community finds it must use desalination to obtain fresh water because deeper wells no longer work. Another example involves metals extraction. As the quality of the metal ore drops, the amount of waste material rises slowly at first, and then rapidly escalates as metal concentrations approaches 0%, as in Figure 2. The sharp shift in the cost of extraction wreaks havoc with economic models based on a long period of very slowly rising costs. In a period of slowly rising costs, technological advances can easily offset the underlying rise in extraction costs, leading to falling total costs. Once limits are approached, technological advances can no longer completely offset underlying cost increases. The inflation-adjusted cost of extraction starts rising. The economy, in effect, starts becoming less and less efficient. This is in sharp contrast to lower costs and thus apparently greater efficiency experienced in earlier periods. 4. Energy consumption is integral to “holding our own” against other species. All species reproduce in greater numbers than need to replace their parents. Natural selection determines which ones survive. Humans are part of this competition as well. In the past 100,000 years, humans have been able to “win” this competition by harnessing external energy of various types–first burned biomass to cook food and keep warm, later trained dogs to help in hunting. The amount of energy harnessed by humans has grown over the years. The types of energy harnessed include human slaves, energy from animals of various sorts, solar energy, wind energy, water energy, burned wood and fossil fuels, and electricity from various sources. Human population has soared, especially since the time fossil fuels began to be used, about 1800. Figure 3. World population based on data from “Atlas of World History,” McEvedy and Jones, Penguin Reference Books, 1978 and Wikipedia-World Population. Even now, human population continues to grow (Figure 4), although the percentage rate of growth has slowed. Figure 4. World population split between US, EU-27, and Japan, and the Rest of the World. Because the world is finite, the greater use of resources by humans leads to lesser availability of resources by other species. There is evidence that the Sixth Mass Extinction of species started back in the days of hunter-gatherers, as their ability to use of fire to burn biomass and ability to train dogs to assist them in the hunt for food gave them an advantage over other species. Also, because of the tight coupling of human population with growing energy consumption historically, even back to hunter-gatherer days, it is doubtful that decoupling of energy consumption and population growth can fully take place. Energy consumption is needed for such diverse tasks as growing food, producing fresh water, controlling microbes, and transporting goods. 5. We depend on a fragile self-organized economy that cannot be easily replaced. Individual humans acting on their own have very limited ability to extract and control resources, including energy resources. The only way such control can happen is through a self-organized economy that allows people, businesses, and governments to work together on common endeavors. Development of a self-organized economy started very early, as bands of hunter-gatherers learned to work together, perhaps over shared meals of cooked food. More complex economies grew up as additional functions were added. These economies have gradually merged together to form the huge international economy we have today, including international trade and international finance. This networked economy has a tendency to grow, in part because human population tends to grow (Item 4 above), and in part because greater complexity is required to solve problems, as an economy grows. This networked economy gradually adds more businesses and consumers, each one making choices based on prices and regulations in place at the particular time. This networked economy is fragile. It can grow, but it cannot easily shrink, because the economy is constantly optimized for the circumstances at the time. As new products are developed (such as cars), support for prior approaches (such as horses, buggies and buggy whips) disappears. Systems designed for the current level of usage, such as oil pipelines or Internet infrastructure, cannot easily be changed to accommodate a much lower level of usage. This is the reason why the economy is illustrated as interconnected but hollow inside. Another reason that the economy cannot shrink is because of the large amount of debt in place. If the economy shrinks, the number of debt defaults will soar, and many banks and insurance companies will find themselves in financial difficulty. Lack of banking and insurance services will adversely affect both local and international trade. 6. Limits of a finite world exert many pressures simultaneously on an economy. There a number of ways an economy can reach a situation of inadequate resources for its population. While all of these may not happen at once, the combination makes the result worse than it otherwise would be. a. Diminishing returns (that is, rising production costs as depletion sets in) for resources such as fresh water, metals, and fossil fuels. b. Declining soil quality due to erosion, loss of mineral content, or increased soil salinity due to poor irrigation practices. 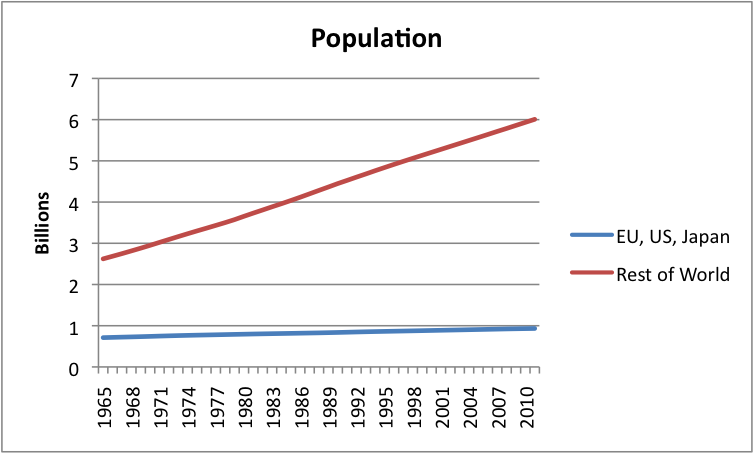 c. Rising population relative to the amount of arable land, fresh water, forest resources, mineral resources, and other resources available. d. A need to use an increasing share of resources to combat pollution, related to resource extraction and use. e. A need to use an increasing share of resources to maintain built infrastructure, such as roads, pipelines, electric grids, and schools. f. A need to use an increasing share of resources to support government activities to support an increasingly complex society. g. Declining availability of food that is traditionally hunted (such as fish, monkeys, and elephants), because an increase in human population leads to over-hunting and loss of habitat for other species. 7. Our current problems are worryingly similar to the problems experienced by earlier civilizations before they collapsed. (a) Reduced job availability and lower wages, especially for new workers joining the workforce. (c) Growing demands on governments for services, because of (a) and (b). (d) Declining ability of governments to collect sufficient taxes from workers who are producing less and less (because of diminishing returns) and because of this, receiving lower wages. (e) Increased reliance on debt. (f) Increased likelihood of resource wars, as a group with inadequate resources tries to take resources from other groups. (g) Eventual population decline. This occurred for two reasons: As wages dropped and needed taxes rose, workers found it increasingly difficult to obtain an adequate diet. As a result, they become more susceptible to epidemics and diseases. Greater involvement in resource wars also led to higher death rates. When collapse came, it did not come all at once. Rather a long period of growth was succeeded by a period of stagnation, before a crisis period of several years took place. Figure 6. Shape of typical Secular Cycle, based on work of Peter Turchin and Sergey Nefedov in Secular Cycles. 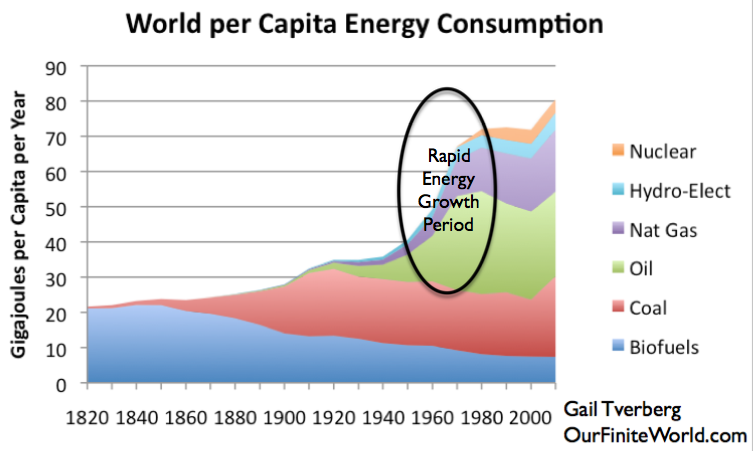 We began an economic growth cycle back when we began using fossil fuels to a significant extent, starting about 1800. We began a stagflation period, at least in the industrialized economies, when oil prices began to spike in the 1970s. Less industrialized countries have been able to continue growth their growth pattern longer. Our situation is likely to differ from that of early civilizations, because early civilizations were not dependent on fossil fuels. Pre-collapse skills tended to be useful post-collapse, because there was no real change in energy sources. Loss of fossil fuels would considerably change the dynamic of the outcome, because most jobs would become obsolete. Most models put together by economists assume that the conditions of the growth period, or the growth plus stagflation period, will continue forever. Such models miss turning points. 8. Modeling underlying the book Limits to Growth shows why depletion can be expected to lead to declining economic growth. It also shows why extracting all of the resources that seem to be available is likely to be impossible. We also know from the analysis underlying the book The Limits to Growth (by Donella Meadows and others, published in 1972) that growing demand for resources because of Items listed as 6a to 6g above will take an increasingly large share of resources produced. This dynamic makes it very difficult to produce enough additional resources so that economic growth can continue. The authors report that the behavior mode of the modeled system is overshoot and collapse. The 1972 analysis does not model the financial system, including debt and the repayment of debt with interest. The closest it comes to economic modeling is modeling industrial capital, which it describes as factories, machines, and other physical “stuff” needed to extract resources and produce goods. It finds that inability to produce enough industrial capital is likely to be a bottleneck far before resources in the ground are exhausted. As an example in today’s world, there seems to be a huge amount of very heavy oil that can be steamed out of the ground in many places including Canada and Venezuela. (The existence of such heavy oil is one reason the ratio of oil reserves to oil production is high.) To actually get this oil out of the ground quickly would require a huge physical investment in a very short time frame. As a practical matter, we cannot ramp up all of the physical infrastructure needed (pipelines, steaming equipment, refining equipment) without badly cutting into the resources needed to “grow” the rest of the economy. A similar problem is likely to exist if we try to ramp up world oil and gas supply using fracking. 9. Our real concern should be collapse caused by reaching limits in many ways, not the slow decline reflected in a Hubbert Curve. One reason for being concerned about collapse is the similarity of the problems our current economy is experiencing to those of prior economies that collapsed, as discussed in Item 7. Another reason for this concern is based on the observation from physics that an economy is a dissipative structure, just as a hurricanes is, and just as a human being is. Such dissipative structures have a finite lifetime. Figure 7. Figure from Hubbert’s 1956 paper, Nuclear Energy and the Fossil Fuels. 10. 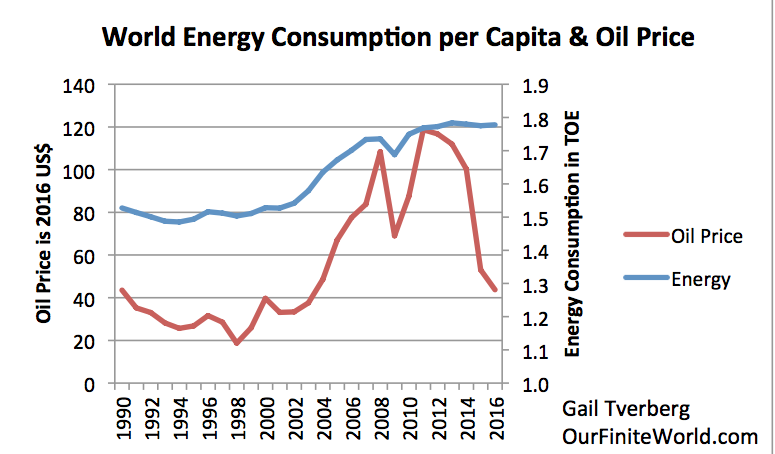 There is a tight link between both oil consumption and total energy consumption and world economic growth. Figure 8. A comparison of three year average growth in world real GDP (based on USDA values in $2005$), oil supply and energy supply. Oil and energy supply are from BP Statistical Review of World Energy, 2014. The link between energy and the economy comes both from the supply side and the demand side. With respect to supply, it takes energy of many types to make goods and services of all types. This is discussed in Item 2 above. (a) People who earn good wages (indirectly through the making of goods and services with energy products) can afford to buy products using energy. (b) Because consumers pay taxes and buy goods and services, growth in demand from adequate wages flows through to governments and businesses as well. (c) Higher wages enable higher debt, and higher debt also acts to increase demand. (d) Increased demand increases the price of the resources needed to make the product with higher demand, making more of such resources economic to extract. 11. We need a growing supply of cheap energy to maintain economic growth. This can be seen several ways. (a) Today, all countries compete in a world economy. If a country’s economy uses an expensive source of energy (say high-priced oil or renewables) it must compete with other countries that use cheaper fuel sources (such as coal). The high price of energy puts the country with high-cost energy at a severe competitive disadvantage, pushing the economy toward economic contraction. (b) Part of the world’s energy consumption comes from “free” energy from the sun. This solar energy is not evenly distributed: the warm areas of the world get considerably more than the cold areas of the world. The cold areas of the world are forced to compensate for this lack of free solar energy by building more substantial buildings and heating them more. They are also more inclined to use “closed in” transportation vehicles that are more costly than say, walking or using a bicycle. Back in pre-fossil fuel days, the warm areas of the world predominated in economic development. The cold areas of the world “surged ahead” when their own forests ran short of the wood needed to provide the heat-energy they needed, and they learned to use coal instead. The knowledge they gained about using coal for home-heating quickly transferred to the ability to use coal to provide heat for industrial purposes. Since the warm areas of the world were not yet industrialized, the coal-using countries of the North were able to surge ahead economically. The advantage of the cold industrialized countries grew as they learned to use oil and natural gas. But once oil and natural gas became expensive, and industrialization spread around the world, the warm countries regained their advantage. (c) Wages, (non-human) energy costs, and financing costs are all major contributors to the cost of producing goods and services. 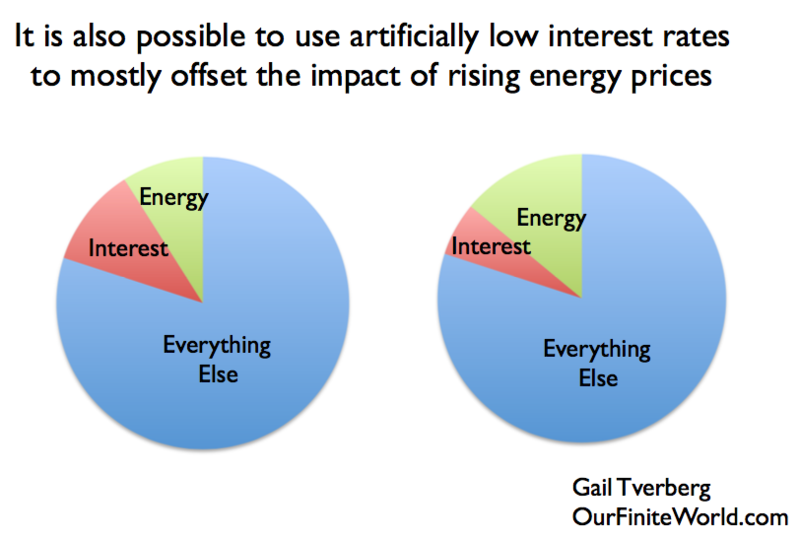 When energy costs rise, the rise in energy costs puts pressure both on wages and on interest rates (since interest rates determine financing costs), because businesses need to keep the total cost of goods and services close to “flat,” if consumers are to afford them. This occurs because wages do not rise as energy prices rise. In fact, pressure to keep the total cost of goods low creates pressure to reduce wages when oil prices are high (perhaps by sending manufacturing to a lower-cost country), just as it adds pressure to keep interest rates low. (d) If we look at historical US data, wages have tended to rise strongly (in inflation-adjusted terms) when oil prices were less than $40 to $50 barrel, but have tended to stagnate above that oil price range. Figure 9. Average wages in 2012$ compared to Brent oil price, also in 2012$. Average wages are total wages based on BEA data adjusted by the CPI-Urban, divided total population. Thus, they reflect changes in the proportion of population employed as well as wage levels. 12. Oil prices that are too low for producers should be a serious concern. Such low prices occur because oil becomes unaffordable. In the language of economists, oil demand drops too low. A common belief is that our concern should be oil prices that are too high, and thus strangle the economy. A much bigger concern should be that oil prices will fall too low, discouraging investment. Such low oil prices also encourage civil unrest in oil exporting nations, because the governments of these nations depend on tax revenue that is available when oil prices are high to balance their budgets. It can easily be seen that high oil prices strangle the economies of oil importers. The salaries of consumers go “less far” in buying basics such as food (which is raised and transported using oil) and transportation to work. Higher costs for basics causes consumers cut back on discretionary expenditures, such as buying new more expensive homes, buying new cars, and going out to restaurants. 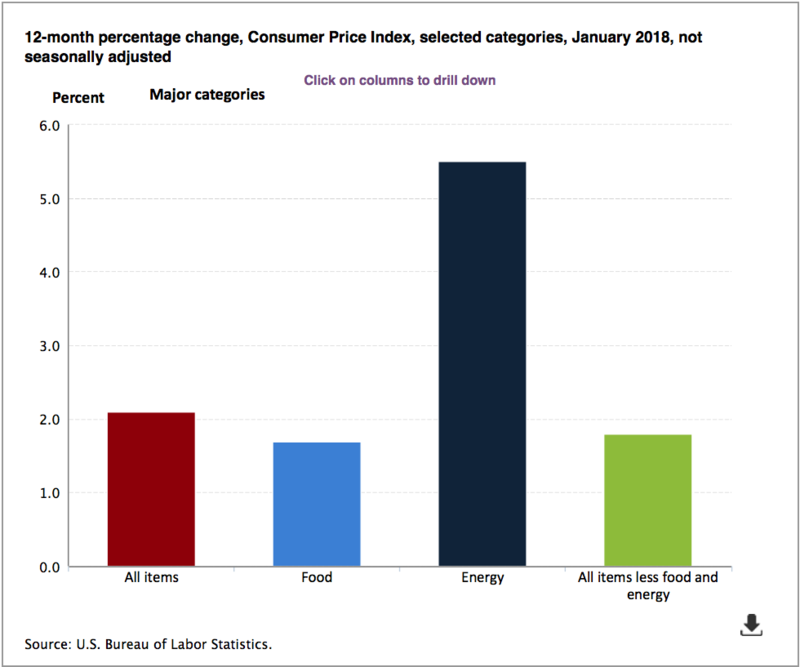 These cutbacks by consumers lead to job layoffs in discretionary sectors and to falling home prices. Debt defaults are likely to rise as well, because laid-off workers have difficulty paying their loans. Our experience in the 2007-2009 period shows that these impacts quickly lead to severe recession and a drop in oil prices. The issue we are now seeing is the reverse–too low oil prices for oil producers, including oil exporters. These low oil prices are contributing to the unrest we see in the Middle East. Low oil prices also contribute to Russia’s belligerence, since it needs high oil revenues to maintain its budget. We seem now to be at risk in many ways of entering into the collapse scenario experienced by many civilizations before us. One of areas of risk is that interest rates will rise, as the Quantitative Easing and Zero Interest Rate Policies held in place since 2008 erode. These ultra-low interest rates are needed to keep products affordable, since the high cost of oil (relative to consumer salaries) has not really gone away. Another area of risk is an increase in debt defaults. One example occurs when student loan borrowers find it impossible to repay these loans on their meager wages. Another example is China with the financing of its big recent expansion by debt. A third example is the possibility that businesses extracting resources will find it impossible to repay loans with today’s (relatively) low commodity prices. Another area of risk is natural disasters. It takes surpluses to deal with these disasters. As we reach limits, it becomes harder to mitigate the effects of a major hurricane or earthquake. Clearly loss of oil production because of conflict in the Middle East or in other oil producing countries is a concern. This list is by no means exhaustive. Many economies are “near the edge” now. Recent news is that Germany has slipped into recession as well as Japan. One economy failing is likely to pull others with it. Gail Tverberg blogs on Our Finite World. In today’s world, we have a huge amount of debt outstanding. Academic researchers Carmen Reinhart and Kenneth Rogoff have become famous for their book This Time is Different: Eight Centuries of Financial Folly and their earlier paper This Time is Different: A Panoramic View of Eight Centuries of Financial Crises. Their point, of course, is that the same thing happens over and over again. We can learn from past crises to solve our current problems. Part of their story is of course correct. Governments have gotten themselves into problems with debt, time after time. This is happening again now. In fact, the same two authors recently prepared a working paper for the International Monetary Fund called Financial and Sovereign Debt Crises: Some Lessons Learned and Some Lessons Forgotten, talking about ideas such as governments inflating their way out of debt problems and pushing problems off to insurance companies and pension funds, through regulations requiring investment in certain securities. Many seem to believe that if we worked our way out of debt problems in the past, we can do the same thing again. The same assets may have new owners, but everything will work together in the long run. Businesses will continue operating, and people will continue to have jobs. We may have to adjust monetary policy, or perhaps regulation of financial institutions, but that is about all. I think this is where the story goes wrong. The situation we have now is very different, and far worse, than what happened in the past. We live in a much more tightly networked economy. This time, our problems are tied to the need for cheap, high quality energy products. The comfort we get from everything eventually working out in the past is false comfort. If we look closely at the past, we see that in some cases the outcomes are not benign. There are situations where much of the population in an area died off. This die-off did not occur directly because of debt defaults. Instead, the same issues that gave rise to debt defaults, primarily diminishing returns with respect to food and other types of production, also led to die off. We are not necessarily exempt from these same kinds of problems in the future. The reason I bring up these issues is because the problem of too much world debt is now coming to the forefront. The Bank for International Settlements, which is the central bank for central banks, issued a report a week ago in which they said world debt levels are too high, and that continuing the current low interest rate policy has too many bad effects. Something needs to be done to normalize monetary policy. Janet Yellen, Federal Reserve Chair, and Christine Lagarde, managing director or the International Monetary Fund, have also been making statements about the issue of how to fix our current economic problems (News Report; Video). There is the additional rather bizarre point that back in January, Lagarde used numerology to suggest that a major change in policy might be announced in 2014 (on July 20? ), with the hope that the past “seven miserable years” can be followed by “seven strong years.” The IMF has talked in the past about using its special drawing rights (SDRs) as a sort of international currency. In this role, the SDRs could act as the world’s reserve currency, be used for issuing bonds, and be used for setting the prices of commodities such as gold and oil. Perhaps a variation on SDRs is what Lagarde has in mind. So with this background, let’s get back to the main point of the post. 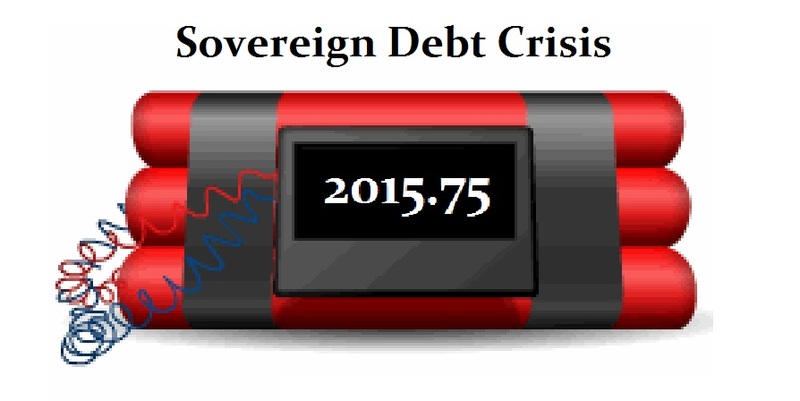 How is this debt crisis, and the likely outcome, different from previous crises? 1. We live in a globalized economy. Any slip-up of a major economy would very much affect all of the other major economies. Banks hold bonds of governments other than their own. If a major government fails to make good on its promises, it can affect other governments as well. Smaller countries, like Greece or Cyprus, can be bailed out or their problems worked around. But if the United States, or even Japan, should run into major difficulties, it would affect the world as a whole. See my post, Twelve Reasons Why Globalization is a Huge Problem. 2. Our problem now is not simply governmental debt; it is debt of many different types, affecting individuals and businesses of all kinds, as well as governments. In the studies of historical debt by Reinhart and Rogoff, the focus is on governmental debt. Now there is much more debt, some through banks, some through bonds, and some through less traditional sources. There are also derivatives that are in some ways like debt. In particular, if there are sharp moves in interest rates, it is possible that some issuers of derivatives will find themselves in financial difficulty. There are also promises that are in many ways like debt, but that technically aren’t guaranteed, because legislatures can change the promised benefits whenever they choose. Examples of these are our current Social Security program and Medicare benefits. Citizens depend on these programs, even if there is no promise that they will continue to exist in their current form. With all of these kinds of debt and quasi-debt, we have a much more complex situation than in the past. 3. Our economy is a self-organized system that has properties of its own, quite apart from the properties of the individual consumers, businesses, governments, and resources that make up the system. Circumstances now are such that the world economy could fail, even though this could not happen in the past. I recently wrote about the nature of a networked economy, in my post Why Standard Economic Models Don’t Work–Our Economy is a Network. In that post, I represented our networked economy as being somewhat like this dome that can be built with wooden sticks. Years ago, when a civilization collapsed, the network of connections was not as dense as it is today. Most food was not dependent on long supply chains, and quite a bit of manufacturing was done locally. If one economy collapsed, even a fairly large one like the Weimar Republic of Germany, the rest of the world was not terribly dependent on it. Figuratively, the “hole” in the dome could mend, and over time, the economy could strengthen and go on as before. We cannot count on this situation today, however. 4. Fossil fuels (coal, oil and natural gas) available today are what enable tighter connections than in the past, and also add vulnerabilities. Early economies relied mainly on the sun’s energy to grow food, gravity to help with irrigation, human energy and animal energy for transport and food growing, wind energy to power ships and wooden windmills, and water energy to operate water wheels. Wood was used for many purposes, including heating homes, cooking, and making charcoal to provide the heat needed to smelt metals and make glass. In the past two hundred years we have added fossil fuels to our list of fuels. This has allowed us to make metals in quantity, as well as concrete and glass in quantity, enabling the development of much technology. The use of coal enabled the building of hydroelectric dams as well as electrical transmission lines, thus enabling widespread use of electricity. Fossil fuels enabled other modern fuels as well, including nuclear energy, and the manufacture of what we today call “renewable energy,” including today’s wind turbines and solar PV. 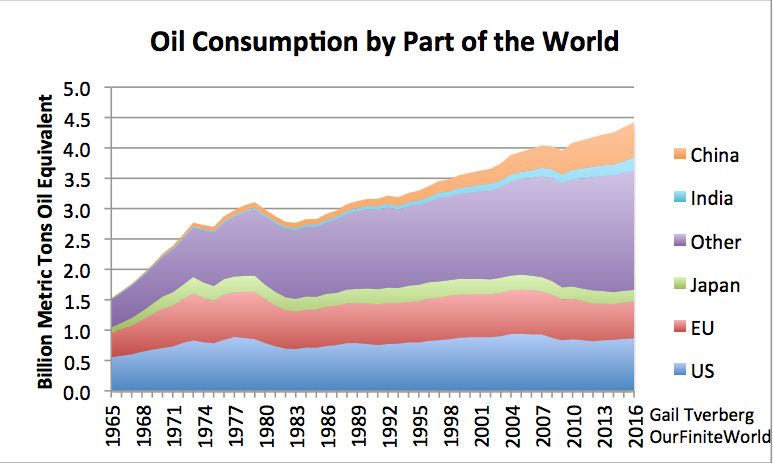 Of the fossil fuels, oil has been especially important. Oil is particularly good as a transport fuel, because it is easily transported and very energy dense. With the use of oil, transport by smaller vehicles such as cars, trucks and airplanes became possible, and transport by ship and by rail was improved. Such changes allowed international businesses to grow and international trade to flourish. Economies were able to grow much more rapidly than in the pre-fossil fuel era. Governments became richer and began offering education to all, paved roads, and benefits such as unemployment insurance, health care programs, and pensions for the elderly. Thus, fossil fuels enable a very different lifestyle, and very different governments and government programs than existed prior to fossil fuels. If something were to happen to all fossil fuels, or even just oil, most businesses would have to cease operation. Governments could not collect enough taxes to continue functioning. Very few farmers would be able to produce food and transport it to market, because oil is used to transport seeds to farmers, to operate machinery, to operate irrigation equipment, to transport soil amendments, and to create herbicides and pesticides. This situation now is very different from the past, when most food was produced using human and animal labor, and transport was often by a cart pulled by an animal. Before fossil fuels, even if governments collapsed and most people died off, the remaining people could continue growing food, gathering water, and going about their own lives. If we were to lose oil, or oil plus electricity (because oil is required to maintain electric transmission and because businesses tend to close when they are missing either oil or electricity), we would have a much harder time. Most of our jobs would disappear. Banks wouldn’t be able to operate. Our water and sewer systems would stop working. We would find it necessary to “start over,” in a very different way. 5. Because of the big role of debt today, economic growth is essential to keeping the current economic system operating. It is much easier to pay back debt with interest when an economy is growing than when it is shrinking, because when an economy is shrinking, people are losing their jobs. Even if only, say, 10% lose their jobs, this loss of jobs creates many loan defaults. Banks are likely to find themselves in a precarious position and are likely to cut back on lending to others, making the situation worse. If the economy starts shrinking, businesses will also have difficulty. They have fixed costs, including rent, management salaries, and their own debt repayments. These costs tend to stay the same, even if total revenue shrinks because of an economic slowdown. Because of these problems, businesses are also likely to find it increasingly difficult to pay back their own debt in a recession. They are likely to find it necessary to lay off workers, making the recession worse. If economic growth is very low, this lack of growth can to some extent be covered up with very low interest rates. But such very low interest rates tend to be a problem as well, because they encourage asset bubbles of many sorts, such as the current run-up in stock market prices. It is not always clear which bubbles are being run up by low interest rates, either. For example, it is quite possible that the recent run-up in US oil extraction (see Figure 4, below) is being enabled by ultra-low interest rates debt (since this is a cash-flow negative business) and by investors who a desperate for an investment that might yield a slightly higher yield than current low bond yields. Actually, the current need for growth to prevent defaults is not all that different from the situation in the past 800 years. In Reinhardt and Rogoff’s academic paper mentioned above, the authors remark, “It is notable that the non-defaulters, by and large, are all hugely successful growth stories.” Reinhardt and Rogoff didn’t seem to understand why this occurred, however. 6. The underlying reason regarding why we are headed toward debt problems is different from in the past. We now are dependent both on oil products and electricity, two very concentrated carriers of energy, instead of the more diffuse energy types used in the past. Our problem is that these energy carriers are becoming high-cost to produce. It is these high costs (a reflection of diminishing returns) that lead to economic contraction. This time, in order to continue economic growth, we need a growing supply of very high-quality energy products, namely oil products and non-intermittent electricity, to support the economy that we have built. These products need to be low-priced, if customers are to afford them. Thus, it should not be surprising that economic growth in the past seems to have been driven by a combination of (1) falling prices of electricity as we learned to more efficiently produce it, and (2) continued low prices for oil. Figure 2. Electricity prices and electrical demand, USA 1900 – 1998 from Accounting for Growth, the Role of Physical Work by Robert Ayres and Benjamin Warr, Structural Change and Economic Dynamics, February, 2004). According to Ayres and Warr (Figure 2), power stations in 1900 converted only 4% of the potential energy in coal to electricity, but by 2000, the conversion efficiency was raised to 35%. This improvement in efficiency allowed the continuing decrease in electricity prices. With lower prices, more individuals and businesses were able to afford electricity, and more technology using electricity became feasible. Cheap electricity allowed goods to be produced at prices that workers could afford, and the system tended to grow. For oil, the price of oil remained relatively flat in inflation-adjusted terms for a very long time, even as engineers developed ever-more-efficient devices to use that oil. We ran into our initial problems extracting oil cheaply in the early 1970s, after US oil production started to decline (Figure 4). Figure 4. US crude oil production split between tight oil (from shale formations), Alaska, and all other, based on EIA data. Shale is from AEO 2014 Early Release Overview. Back in the 1970s, we were able to work around the price spike by bringing oil production online in several additional places, including the Alaska, the North Sea, and Mexico. Unfortunately, those areas are now declining as well. Thus, we are increasingly forced to extract oil from areas that are high priced either (a) because of high extraction costs (such as the tight oil now being extracted in the United States) or (b) because of high indirect costs (such as the need for desalination plants and food subsidies in the Middle East). 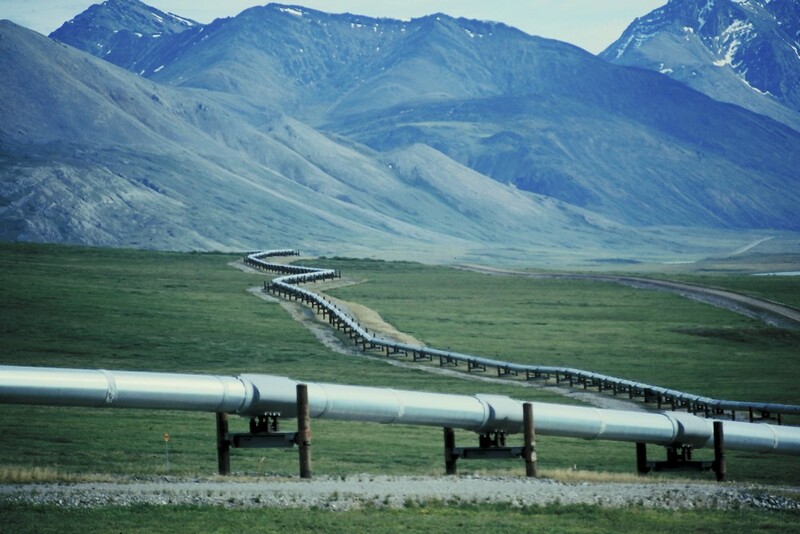 These can only be funded if oil prices are high, allowing governments to collect high levels of taxes. There is considerable evidence that high oil prices are associated with recession. The Great Recession of 2007-2009 was associated with a huge spike in oil prices. I have written about the way high oil prices contribute to recession in a peer-reviewed article published in the journal Energy called Oil Supply Limits and the Continuing Financial Crisis. James Hamilton has shown that has shown that 10 out of 11 US recessions since World War II were associated with oil price spikes. Hamilton also showed that the effects of the oil price spike were sufficient to cause the recession of that began in late 2007. Now the cost of oil production is high, and electricity prices have stopped falling. We read U. S. electricity prices may be going up for good, from the L. A. Times. It should be no surprise that economic growth is now a problem. 7. In historical periods, defaults were mostly associated with the transfer of ownership of various productive assets (such as land and factories) from one owner to another. Now, we are vulnerable to changes that could ultimately cut off oil and electricity, and thus bring the system down–not just transfer ownership. War in the Middle East that would vastly disrupt oil exports. We do not have alternative suppliers–the world would have to do without part of its supplies. We are vulnerable now, because oil exporters are getting “squeezed” by prices that have not risen substantially since 2011. This makes it harder for Middle Eastern countries to fund their budgets, making wars and civil disorder more likely. A spike in oil prices, perhaps caused by a war in the Middle East, that would vastly disrupt oil exports. Oil importing countries would head back into recession, with many layoffs. Governments are in worse shape for fighting this situation than they were in 2007-2008. An increase in interest rates. While Quantitative Easing and Zero Interest rate policy may not look like they are doing much, an increase in interest rates would not work well at all. With higher interest rates, governments would owe more in interest payments, so would need to raise taxes (leading to recessionary effects). The monthly payments required for buying high-priced goods (from cars, to houses, to factories) would rise, cutting back on demand, also tending to lead to recession. A decrease in lending, or even a failure of debt to keep rising, would also be a problem. Janet Yellen’s recent IMF speech highlighted the possibility of using regulation to prevent excessive debt. Unfortunately, increasing debt is very much needed to keep oil prices high enough to enable extraction at today’s high cost levels. 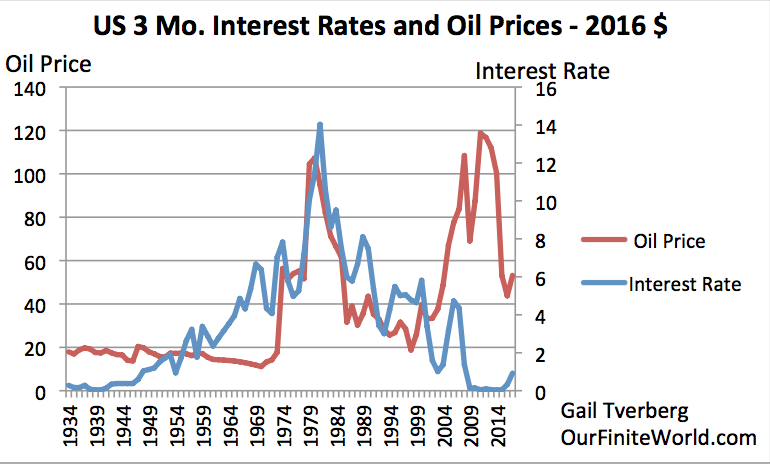 See my post The Connection Between Oil Prices, Debt Levels, and Interest Rates. If debt levels drop, we run the danger of oil prices dropping as dramatically as they did in late 2008, when lending froze up. Figure 5. Oil price based on EIA data with oval pointing out the drop in oil prices, with a drop in credit outstanding. 8. The world is now filled with a large number of people in powerful positions who mistakenly think they know answers to questions, when they really do not. The problem is that researchers tend operate in subject-matter “silos.” They build models based on their narrow understanding of a problem. These models may temporarily work, but as we reach limits in a finite world, these models produce misleading results. The users of these models do not understand the problem and make decisions based on badly flawed models. Economists do not understand energy issues. They seem to think that their models, which ignore energy issues, are fine. All they need to do is fine-tune regulation, or tweak interest rates, and everything will be fine. Unfortunately, these economic models no longer work, as I explained in a recent post, Why Standard Economic Models Don’t Work–Our Economy is a Network. In fact, the issue is more basic than just bad models that economists are using. The whole “peer-reviewed paper” system, with its pressure to write more peer-reviewed papers, each resting on prior peer-reviewed papers, is flawed. Models are built and used endlessly, in part because that is the way things have been done in the past. Once an approach is used frequently, everyone assumes it is correct. Models can and do have short term-predictive power, but that fact does not mean that the approach works for the long term. Models that are no longer correct fill every area of study, from actuarial models, to financial planning models, to economic models, to models forecasting future oil and gas production, to climate change models. Some models are deceptively simple–the idea that the number of years of future production of oil (or gas or coal) can be estimated by [Amount of Resources / Current Annual Production] is a simple model. Unfortunately, this model doesn’t work, because we can never get enough investment capital to extract all of the fossil fuel that seems to be available–the price can never go high enough, and stay high enough. High prices simply bring on recession. See my post, IEA Investment Report – What is Right; What is Wrong. In fact, it is pretty hard to find any model that continues to work, as we reach limits in a finite world. This is not intuitively obvious. If a model worked before, why wouldn’t it work now? Researchers and well-meaning leaders follow models that sort of worked in the past, but don’t really model the current situation. Thus, we have well-meaning leaders, doing their best to make things better, inadvertently making things worse. In a finite world, everything is “connected” to everything else, so things that look beneficial from one perspective can have a bad outcome viewed another way. For example, a reduction in carbon dioxide emissions from closing coal plants risks major electrical outages is New England and seems likely to raise electricity prices. Such changes push the economy toward recession, and perhaps ultimately toward collapse. Governments are one area squeezed by higher oil and electricity costs. As governments cut back, whether these cut backs are in education, unemployment benefits, military spending, or healthcare spending, there are indirect effects on the economy as a whole. The problem is that government spending creates jobs. As government spending is cut, it pushes the economy toward contraction–even if part of today’s spending is clearly wasteful. It creates a conundrum–fixing one problem makes another problem worse. We live in perilous times. We have leaders who think they know the answers but, in fact, they do not. The debt problems we face now are not just overspending problems; they are signs that we are reaching limits of a finite world. World leaders do not seem to understand this connection. It is not even clear that they understand the connection of debt problems to the need for cheap-to-produce, high-quality energy products. World leaders are nevertheless convinced that they know the answers, based on complex, but very flawed, models. Unfortunately, actions taken based on these models have a good chance of making the situation worse rather than better. For example, trying to tie a world economy closer together, when it is already heading toward collapse, seems like a recipe for disaster. I find Christine Lagarde’s use of numerology in her January 14, 2014 speech at the National Press Club Luncheon disturbing. Is she trying to signal some “in crowd” to make different decisions, in advance of a big IMF announcement? Or is numerology being used for prediction? Such an approach to forecasting would seem to be even worse than using models based on silos of limited understanding.